Our cat Puck has been peeing on the floor for the past several weeks now in addition to the pooping on the floor that has been going on for a couple of years. Regular readers know that he developed a bladder infection that started the problem but after getting better, the peeing continued. 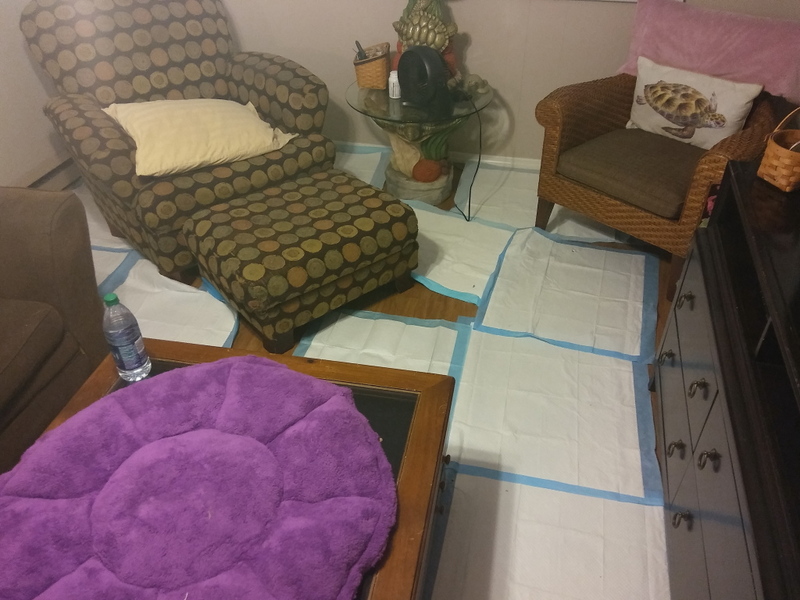 Our living room is now a sea of pee pads. The vet put Puck on Prozac a couple of weeks ago but getting him to take it has been hard. I don’t want to add to his stress by shoving it down his throat so I put it in his food. Unfortunately, he eats only half of his food, or less, when there is a crushed up pill in it. It is actually only a half of a very small pill so it surprises me that he even notices it. Putting it in tuna helps but giving cats tuna every day is not healthy. Tuesday evening I noticed a couple of half-dollar size spots of pee on the floor and knew Puck’s bladder issue had returned. We made an appointment for the vet this morning but I have to be at work so my wife will be taking him in. Hopefully, if we get his bladder problem resolved he will start using the box again. This entry was posted in Uncategorized and tagged bladder problem, cat, infection, litter box issue, pee, vet on July 27, 2017 by Charles Huss. We are hoping and praying that something can be done to help poor Puck AND you as well since it’s a terrible problem to deal with all around. Thank you for your concern. He will be at the vet all day so hopefully they will know something tonight. Thanks. We have our fingers crossed. I am so sorry Puck’s problems continue. Prayers and paws crossed that the vet can find something to help ! Oh Puck, we wish you the best. POTP to you and your pawrents. Have you ever heard of the Purr kitty pillow? Maybe he’d like to cuddle with it. I will have to look that up. Thank you. It’s about $9 at DrFosterSmith or Petco, albeit even WalMart. That is an interesting product and I am willing to try anything. Bummer. Have you tried changing up the foods you hide the pill in? Cream cheese, ham, chicken, cheese, hamburger? Cream cheese might work. Great idea. Thanks. Have you tried a purr pillow for Puck? We hope the Vet helps Puck. POTP. Thanks. If I can’t find another way soon, I will look into that. I am sending lots of purrs to Puck – I really hope you guys can get his issue resolved soon! Poor Puck, he must be in pain to be doing that. I hope he feels better soon. Thanks. We thought his bladder issues were better and his peeing was just a psychological problem but now I wonder if it never really went away. The last time he was at the vet they did no tests so who knows. I have good luck administering my cat Andy’s blood pressure medicine in a tuna-flavored liquid form worked up by his veterinarian’s staff. Can Prozac be put in a liquid? Granted, I sometimes have to wrap him in a towel to give him the liquid with a plastic syringe, but most times he just gives me big, sad eyes and turns his head as far as it will go, but, with a little effort, finally gets his dose. I heard that Prozac can be compound to a more palatable form. I need to look into it. A nice chicken-flavored paste would be nice! Of course, as you’ve already experienced, food is a hit or miss proposition. I’ve never had good luck putting medicine in food. Poor Puck, I hope that you now will succed with that problem. I understand what you mean, we have had problem cats, too. Thank you. We are running out of ideas. Hopefully we can figure it out soon.